SL-5868P is an extremely versatile instrument with bigger & wider 30-130dB range. Equipped with built-in calibration signal of 94dB at 1kHz and offers 4 measurement parameters such asLp for sound level, Leq for equivalent contiuous A sound level, Lmax for maximum sound level andLN for percent of all readings over alarm value set. You can saved, retrieved and delete the readings together with the measured conditions to the memory of the meter for later use or data transfer. The meter itself can memorized 30 groups/sets of measurement results and condition. And to add to its versatility and powerful functions, a RS-232C software, capable totransfer data from meter to computer complete with real time and date stamp. With RS-232C software CD, these groups of data can now be download directly to your computer, not only that you can save, retrieve and delete these data from your computer but you can also export it to MS Excel easily. SL-5868 permits A, C and F (Flat) frequency weighting with Slow & Fastresponse time. 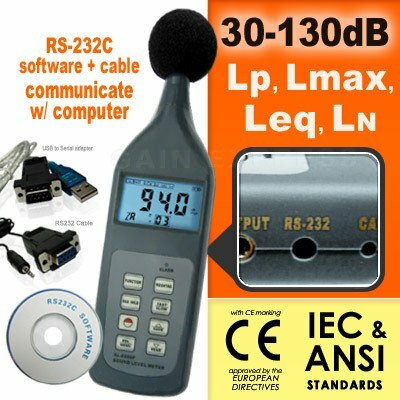 It doesn't just stop there, features like programmable auto power off that can be set and disable, adjustable alarm set in which the set value can be adjusted from 30-130dB,LED alarm output and auto range selection have been added to this multi-function sound level meter. Our datalogger sound level meter, SL-5868P, durable and useable for a very broad field of application such as machines, traffic, vehicle, architecture acoustics, environment noise and electric noise, ship, office environment, workshop, flight and other noise. Fit for industry environment protecting, working, sanitation, teaching research and other departments. We keep in mind that the safety of the user should always comes first. We made sure that our products comply with all the health and safety required standards set by the European Directives and a GB/T3785, IEC 651 Type 2, and ANSI 1.4 Type 2 compliant. Experience the versatility of SL-5868P with high accuracy and unquestionable performance! Gathered data in meter can be saved, retrieved and deleted and downloaded or transfer to computer directly plus it can also be exported to MS excel. With adjustable auto power off that can be changed to any value between 1-9min and can also be manually turned off anytime. Parameters measured: Lp, Leq, Lmax, LN. Time weighting: FAST 125mS , SLOW: 1 sec.